What are the major milestones that R20 has achieved since it was founded in 2010? R20 - Regions of Climate Action is a not-for-profit international organization founded in November 2010 by Arnold Schwarzenegger with the support of the United Nations. Its mission is to help sub-national governments, local authorities and mainly the regions, to develop projects which reduce carbon emissions or to put in place renewable energy and energy efficient systems. Since its establishment, R20 has to its credit several important achievements, including a photovoltaic project with a capacity of 50 MW in Kita, Mali (the largest solar energy production project in West Africa today), a pipeline of LED street lighting projects (1.5 million lighting points) in half a dozen cities in Brazil, and a “Zero Waste, Energy Efficiency and Capacity Building” program for waste management and valorization in the Wilaya province of Oran, in Algeria. Following the signing of the Paris Agreement, we have continued to mobilize regions and territories so that they can be the first actors in the fight against climate change. Through the 100 Climate Solutions Project Campaign that we have launched with the Leonardo DiCaprio Foundation and the help of numerous partner networks (FMDV, ICLEI, ARDCI, Green Cross, etc. ), we have been able to identify more than 400 green infrastructure projects in different sectors (renewable energies, waste processing, energy efficiency, construction, agriculture, etc…) Additionally, our teams have worked to put in place a value chain that will eventually finance some of the projects identified. 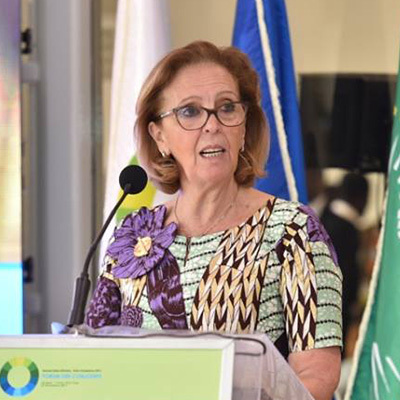 We also continue to work on the establishment of the R20 Green Fund for Women, which we presented to the First Ladies of Africa and Europe in Abidjan (Côte d’Ivoire), during the AU-EU Summit. Can you tell us more about the Fund for Women in the Green Economy which you created and the role of women in combatting climate change? Today, amongst the two billion poorest people in the world who are also the most impacted by the effects of climate change the vast majority are women and girls. It is only recently that equality between women and men in sectors such as energy, agriculture, transport, construction and forestry has begun to be recognized as a key solution to increase enhance the effectiveness of the fight against climate change. In view of these findings, during COP 22, R20 committed to launching a Green Fund for Women to contribute to the empowerment of women by giving them the means to contribute to ecological initiatives and to responsible and sustainable development. With this fund, we become a receptacle of very concrete initiatives that will benefit from our expertise, our network, and funding to speed things up. In your view, what are the must urgent priorities for cities and territories in terms of meeting the commitments made during COP21 and the One Planet Summit? Territories are key spaces for social cohesion and economic development. We are convinced that action at the regional level must be a priority. Sub-national governments are the most well-positioned to implement sustainable projects because they are fully aware of the resources of their own territories. In collaboration with the various local actors and their fellow citizens, local entities have demonstrated that they are among the first to translate climate action on the ground and to develop operational tools. COP21 and the One Planet Summit demonstrated concretely the strength of local ecosystems in the development of innovative projects and the establishment of a sustainable economy. I think we need to build on that momentum and focus on three core priorities at the local level: Ecology, Education, and the Economy.